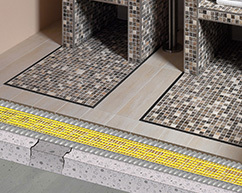 With the increasing use of CI+ matting to prevent tile cracking and de bonding on heated floors, we have been asked to clarify the actual thermal properties of the product. 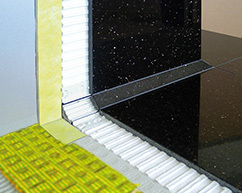 We always state that in effect the use of CI+ matting has a negligible effect on the passage of heat through the installation, however for those of a more technical mind set the following information may be of interest. The following information is taken from calculations made by a professional under floor heating supplier for a specific project. The project involved a wet under floor heating system, the use of CI+ matting to control and prevent cracking and de bonding. 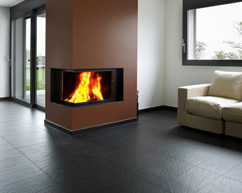 The tiled surface was a 10mm modern large format porcelain tile fixed with standard tile adhesives. Because each project is unique, please use this information as a guide only. The polypropylene webbing is 0.1mm thick with a thermal resistivity of 0.00067m2k/W. The polyethylene matting is 0.63mm thick with a thermal resistivity of 0.00085m2k/W. This is a very low figure and can be considered negligible. The air void below the CI+ matting is a greater insulation issue. This was calculated as having a greater resistivity of 0.093m2k/W. It is worth bearing in mind that the calculation for the air space is based on the volume of air in un – fixed matting. When fixed in place the volume of air will decrease due to the displacement of air by the tile adhesive. This could be by as much as 40%. In the case of this project the resistivity for the surface covering including CI+ matting 10mm tiles and standard adhesive bed was 0.132m2k/W. This compares to the use of a commercial grade carpet with a resistivity of 0.150m2k/W. Due to the varying nature of each project the figures provided above can only be taken as a guideline. In practical terms the user of CI+ matting can be assured that the benefits of using the product far outweigh its negligible impact on heat transfer.